If your home’s ceilings are coated in popcorn covering and you want a smoother finish, be prepared for some time consuming work and job preparation. Removing popcorn ceilings takes a lot of effort and an evaluation for asbestos before the job can begin. Once you have decided that you would like to tackle this labor intensive project, scrape a small amount of the ceiling coating into a bag and have it tested for the presence of asbestos. If asbestos is found, the ceiling will need to be removed by a professional company. When the all clear is given and you are ready to proceed, follow the steps below to get you started. Getting the room prepared properly is important. It ensures that the walls and floors will not be damaged and the residue from the ceiling will stay contained. Start by covering all the walls and floor with thick plastic sheeting. Tape the edges of the sheets together with duct tape or heavy-duty masking tape to prevent water from seeping under the seams. Be sure that all electrical outlets are covered with a double layer of plastic coating, as water in the outlets would be both dangerous and damaging. Once the room is covered with plastic and taped securely, shut off the electricity at the main circuit breaker. Test to make sure that there is no current flowing through the outlets with a circuit tester. 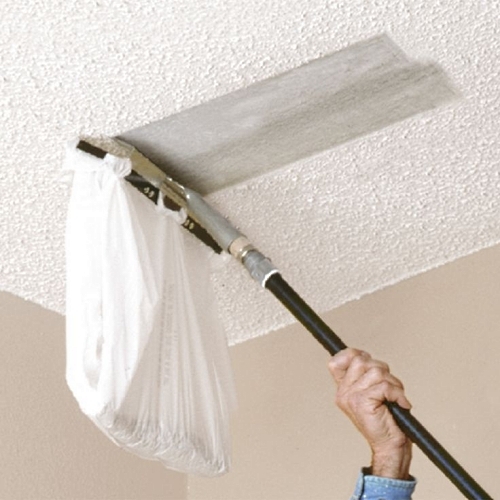 Remove any ceiling lights, fans and other ceiling accessories. Make sure that the electrical wires are securely taped, so that the water in the next step does not get to them. 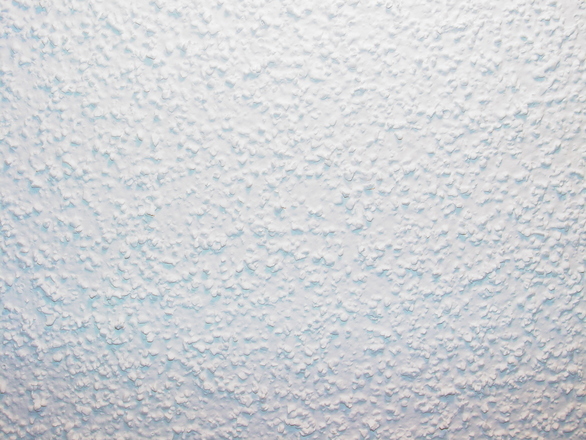 Using a spray canister, spray the popcorn ceiling with water. Use a flat edge scraper and gently remove scrape the ceiling to remove the coating. It is a good idea to wear safety goggles and a paint mask while performing this part of the job, as small particles and dust can easily find their way into your eyes and mouth. Continue scraping until all the popcorn ceiling coating is removed. For particularly stubborn patches of coating, re-wet and let them sit for a few minutes before attempting to scrape them again. Once the ceiling has been scraped clean, remove the plastic from the walls first. Fold the plastic in onto the floor covering. Then start lifting the floor covering from the outer edges and folding it in toward the middle. Work around the room in this fashion, so that the debris and dirt remain on the plastic. Place the folded up plastic in a large, heavy-duty garbage bag to dispose of it. At this point the popcorn ceiling coating has been removed, but remember that there is additional work needed to repair the ceiling. Patching, priming and repainting will all be necessary to get the ceiling back in top shape. It is possible to break the process down into two weekends, or even three, if necessary. Although the work is labor intensive, the resulting smooth ceiling will be attractive and up to date.